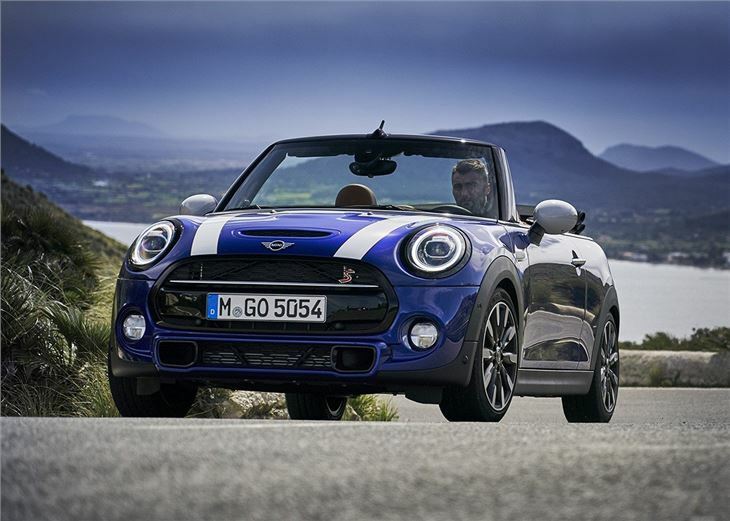 There's been plenty of pretenders to the throne but when it comes to classy, small four-seat drop-tops nothing has come close to usurping the MINI's fine blend of style, great driving dynamics and sheer sense of fun. 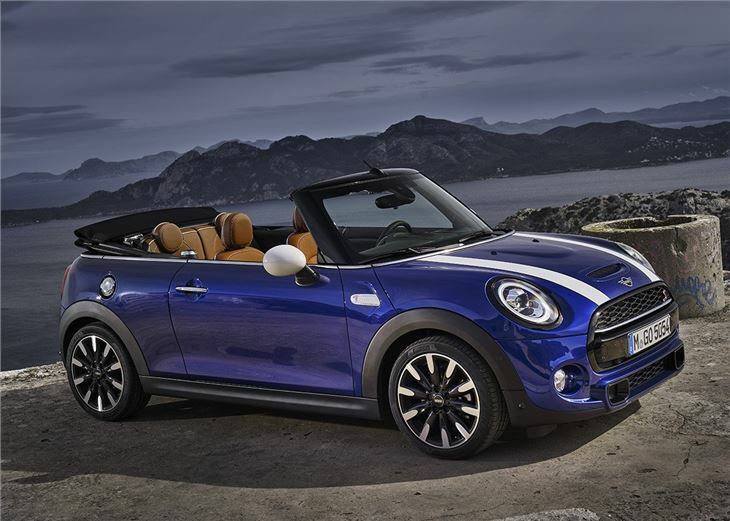 The headline news for 2018 is the MINI Convertible gets a new engine and transmission, plus more advanced tech, an updated infotainment system and levels of personalisation that was once the preserve of luxury car brands, like Rolls-Royce. In the flesh, at first glance it's almost impossible to tell the old from new unless, that is, you clock the latest car's front lamps that get ring-shaped LED running lights. 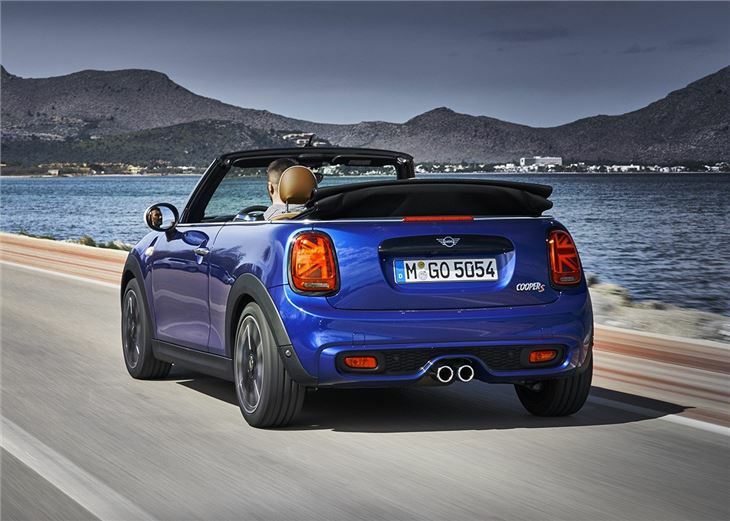 At the rear of the car, it's far more obvious you're looking at the 2018 MINI. Not least because its oversized tail lamps now sport a pair of Union Jack-inspired full LED graphics. We'll leave it up to you to decide if you think this cheeky dose of patriotism works or if they're just pure tacky. 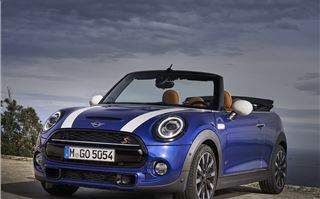 Under the bonnet the little punchy 136PS 1.5-litre turbo petrol carries over unchanged and powers the entry-level Cooper model. 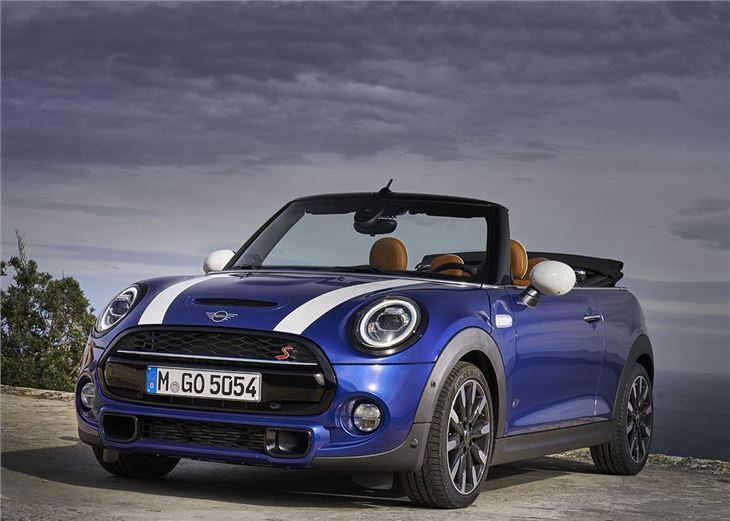 The big news is the old 2.0-litre turbo that powers the Cooper S and John Cooper S has been replaced by an all-new turbocharged 2.0-litre. Producing exactly the same 192PS as the last engine, you could be forgiven for thinking there's little to distinguish between the new motors but look closer and you'll see the latest turbo petrol produces its identical 280Nm torque peak at 1350rpm - 100rpm later than the old model. It's a bit disappointing the new 2.0-litre turbo, on paper at least, isn't quite as efficient as the old engine, averaging 44.8mpg –1.5mpg less than the old model (while emitting 145g/km of CO2 – 6g/km more). 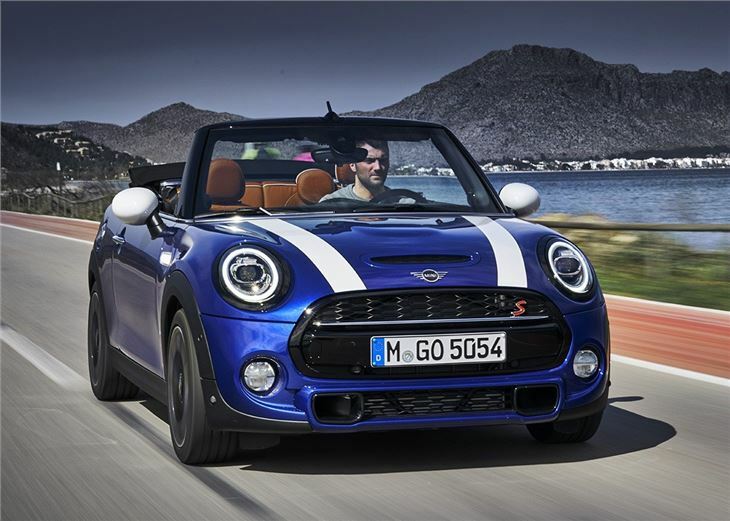 Against the clock, there's been no improvement in performance, with the reengineered Cooper S droptop taking the same the same 7.2 seconds to hit the 62mph and tops out at 143mph. For our drive, in the absence of the Cooper and the hottest John Cooper Works, we sampled a Cooper S with the car maker's new seven-speed dual-clutch transmission that replaces the old car's six-speed auto. A six-speed manual is also available. Interestingly, the 231PS John Cooper Works is so powerful the new seven-speed dual-clutch can't cope with its muscular 320Nm torque peak so makes do with either a six-speed manual or a tougher eight-speed automatic. 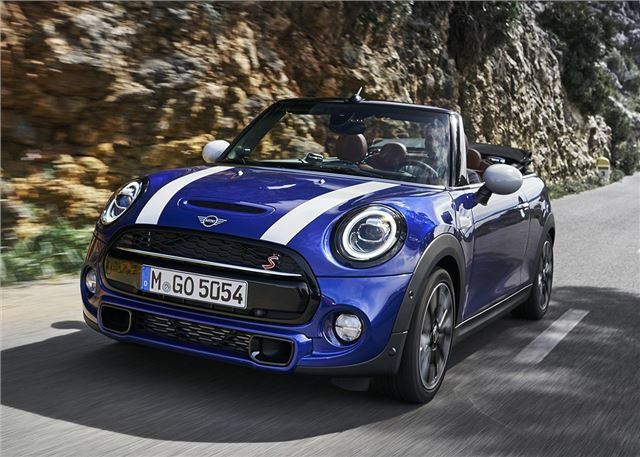 In recent times many car makers have abandoned the dual-clutch transmissions for cheaper, less complex traditional autos but MINI's choice of the quick changing, efficient seven-speed pays off behind the wheel. In town it's smooth and relaxed while out on some country roads the 'box is quick, intuitive and engaging in its 'Sport' setting. Our car missed out on steering wheel-mounted paddles - but all UK cars will get them, heightening experience as, occasionally, the dual-clutch auto dishes up an unwanted up-change. 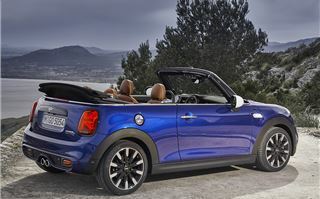 It seems strange to be talking about driver entertainment for a small convertible mostly bought for its poseur appeal but, from day one, the roofless MINI has always been a riot to drive. Nothing changes for 2018, although the Cooper S has had completely reworked suspension partly due to the new engine's extra weight. We hoped this might provide MINI engineers the ideal opportunity to improve the former car's unforgiving ride but, sadly, on the occasional rough piece of Spanish road we found the ride remains poor, especially on larger optional 17-inch rims. At least the pay-off is lack of roll through bends and plenty of grip that provides the confidence to push on and enjoy the road. 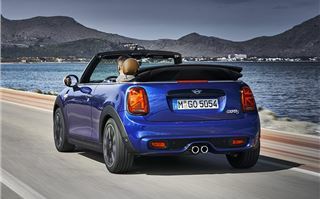 Like before, the small Convertible comes equipped with a two-stage electric hood that can retract at any speed to provide a 400mm wide sunroof in its first mode before folding completely back in a tardy 18 seconds at an 18mph crawl. Once down things can become pretty blustery at speed. Roof back up, while cruising at highway speeds, like before, there's plenty of wind noise. It's also worth noting that despite being based on the latest, larger and stiffer MINI platform there is some noticeable limitations on rigidity with the hood occasionally rubbing (and squeaking) against the door glass. Pity rear passengers too, although being treated to considerably more headroom than the hatch, legroom is almost non-existent - boot space too, but all these major and minor gripes are likely to be overlooked, or simply ignored by buyers seeking the simple wind-in-the-hair thrills of the MINI. 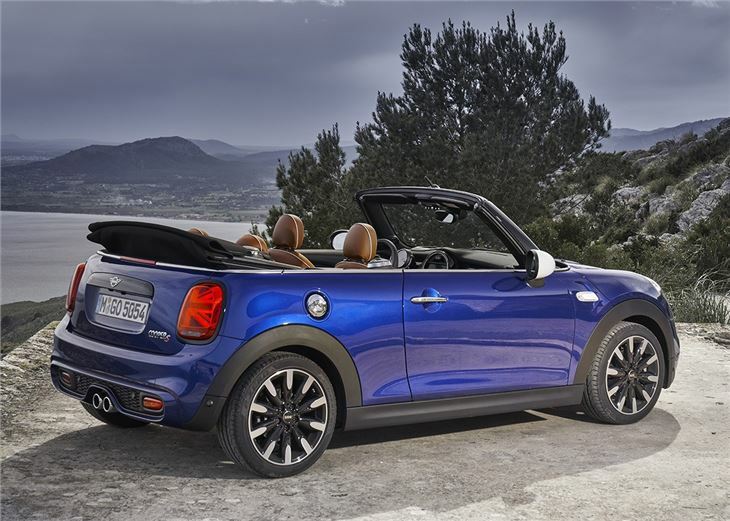 Priced from just £19,790, the small Convertible also looks surprisingly in reach but as with all MINI products that price should come with a financial health warning. Few buyers who leave their local dealer will actually spend anywhere near that sum and will end up dipping into the pricey option bundles like the must-have Chili Pack (£2550) that upsizes the alloys and bags you a half-leather seats and a sportier steering wheel. It's also disappointing that navigation (that brings Apple Carplay) is a £900 extra on all models. Want the larger 8.8-inch infotainment, with all its trick connectivity? That will cost another £2000 – and that's before you've indulged in a bit of personalisation like adding some bonnet stripes (£110) or taking customisation to the next level by designing your own 3D printed side indicator inlays, puddle lights, door sills or even dashboard covering. 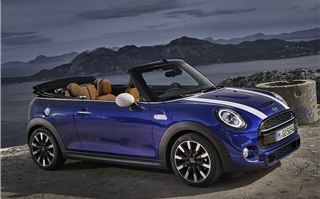 All in all, the little MINI can get seriously expensive but even then, it's hard not to recommend it over its opposition. Only a Mazda MX-5 beats the MINI for thrills behind the wheel but since that car is strictly two-seater most will rule it out on practicality grounds alone. 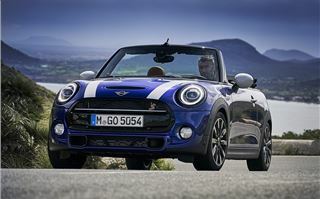 It seems the Cooper S' reign as Britain's best small convertible is set to endure a little longer. 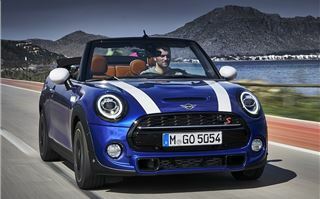 The updated MINI hatch and convertible range is on sale now.